Africans were existing as independent nations and kingdoms without external influence, in peace and love being their brothers' keepers before Europeans colonialists invaded Africa and shared it among themselves like a piece of chocolate cake. The invasion of Africa by these colonial Masters marked a downturn and degradation of morals and institutions of African Nations. The quest for the resources in the African region made the colonial masters introduce all manner of divisions among the peoples to be able to have access to their resources. These traits were later handed over to the groups of people that were African leaders who still continued to exploit their people and bringing all manner of wicked policies against their own people. This was what played out in the event of “Ghana must go” which occurred in 1983. The hatred sowed by the British government in the souls of African leaders played a major role in the wicked policies/actions against their own people and their supposed African neighbours. Prior to the 1970's, Nigerian government who was in the oil boom era needed cheap labor and therefore opened their borders to its neighbors. This allowed the influx of Ghanaian who were the closest neighbors [from the west] who flooded Lagos amidst economic drought and crises. RELATED POST: BIAFRANS CANNOT BE INTIMIDATED... BUHARI MUST OBEY BIAFRA. Years later, the Nigerian government commenced the implementation of an indigenization policy because this time around, they envisaged that Ghanaians in Nigeria are the reason they are having high unemployment rate. They believed that Ghanaians has denied her citizens jobs and businesses. So the Nigerian government decided to expel all Ghanaians within the streets of Lagos. About 2 million Ghanaians were deported en masse which was recorded as the first xenophobic act in the African history. The popular slogan of that time was “Ghana must go” which even the Nigerian people ridiculed them and beat some of the Ghanaians. They complained that the immigrants are the cause of their economic woes and therefore must leave. The people of Biafra in the British created contraption called Nigeria are the most intelligent race in Africa with abundant natural resources in its region.The British colonialists who were interested in the economic fortune of the Biafra region forcefully amalgamated the Biafra people and the Mohammedan Emirates of the North,who they opined cannot survive without the resources in Biafra land. The British government allowed the Hausa/Fulani of the north to have power and control over the resources in various Biafran territories using the divide and rule tactics, thus pitching the owners of the resources against one another. The Biafran people have over the years been subjugated to all manner of inhuman degradation and is now one of the endangered species. Even in the breakout of the civil war, the crude oil in the creeks of Biafra land was the reason why Britain gave the Nigerian government all military support to make sure Biafra was defeated and for them to continue having control over the resources in Biafra land. The case was like starving the hen that lays the golden egg. The economy of Nigeria is largely dependent on the revenues got from oil in Biafra land. The Biafrans were always targeted by every government that comes on board, for marginalization, negligence, unfriendly economic policies, denial of ownership of oil blocs in their own land while strangers shared the oil blocs to themselves. Their places of business in various regions of the country were targetted either bombed or razed. Increasing tariffs on business services, closing the business of Biafrans who they perceived will compete with the businesses of people from the northern Hausa-Fulani extraction. Mass deportation of Biafrans from other cities to Biafra land, in the supposed country where they belonged. The government careless about the lives of Biafrans and this is why with the slightest misunderstanding, Biafrans are always targeted, most times killed by the Hausa Almajiri and also the security agents of the government without anyone being penalized for such atrocities against the Biafrans. There is numerous evidence of hatred for Biafrans who are surrounded by different enemies. In the light of these crimes and servitude, it's time Biafrans leave the unholy marriage. 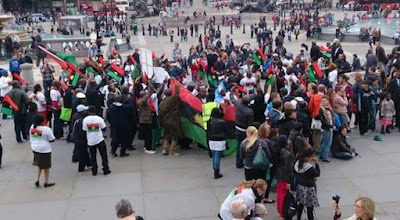 It is time Biafran people control their destiny and free themselves from the occupation of British-Nigeria government whose only basis of nationhood was the oil resources in the Biafra territory. Biafrans have endured for too long. 50 years after the gruesome genocide, the story has not changed. The killings, nepotism, corruption, ethnic bigotry, harsh economic policies, denial of basic infrastructures and so many other aspects of marginalization. The indigenous people of Biafra have resolved to leave Nigeria to save themselves from all these crimes and the world should know this. The African Hitler Buhari who is pursuing a northernization agenda has flagrantly abused the people of Biafra. All his strategic political appointment are shared amongst the northerners even when the Nigerian constitution made it clear that appointment must reflect the federal character. Buhari boldly encouraged the arrests, incarceration, and killing of unarmed Biafran youths by the security agencies, banning businesses belonging to Biafrans and making plans to introduce the grazing bill to enable his Almajiri Hausa-Fulani jihadists to penetrate and dominate Biafra Land. The people of Biafra are not cowards and will not allow themselves to be exterminated hence the renewed quest for the restoration of Biafra. Biafra freedom is all that matters to us and Biafrans are ready to take what belong to them. No amount of intimidation or perversion of justice can stop Biafra freedom from Nigeria.